Support Chicagoland Cardiac Connections Day! On Sunday, September 15th, 2019 our group will host the 7th Annual Chicagoland Cardiac Connections Day at Ann & Robert H. Lurie Children's Hospital of Chicago. We are now in the process of planning for 2019's event and we need your help! Chicagoland Cardiac Connections is Chicagoland's first community for children and young adults with pacemakers and implantable cardioverter-defibrillators (ICDs). Our mission is to help connect young patients to others like them. Our all-volunteer organization conducts the annual Chicagoland Cardiac Connection Day to bring patients, parents, friends, families and providers face-to-face. We want to let everyone know that they are not alone. CCC is open to patients of any age who have a pacemaker or ICD. We welcome family members and friends. If you might receive a pacemaker or ICD someday, come join us! 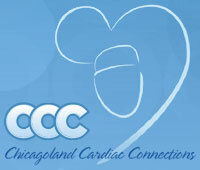 You can learn more about CCC at www.cccheart.org. Our goal is to raise $10,000. We hope you will support our efforts by making a gift today. The hospital relies on philanthropic support to fulfill its lifesaving mission, and any amount will make a difference! All donations are tax-deductible and will be acknowledged by Lurie Children's Foundation. With your help, more children can receive the best healthcare possible and the opportunity to reach their greatest potential.